Another routine visit. This time I requested purple elastic ligatures (my fave color) although I think the pinks are very nice. Strange right? I made it a point to look on the tray to see if my cleaning has been efficient enough (a small reward when I saw that everything was relatively clean). I would have felt embarrassed if I saw the contrary. I take this maybe a little too seriously. I’m still very frustrated by the gaps in-between my teeth (there are two spots in particular I’m watching like a hawk). 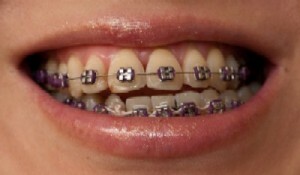 After Dr. B tightened the braces, one gap almost disappeared while the other one got even bigger. It was a low point to see that. I know I’m just impatient. After returning home I began to feel that all too familiar discomfort. Well, tomorrow will be a bad day =(; another round of soft foods I suppose. It’s rough to feel hungry and not be able to have what you want and at a normal eating pace. Hopefully, it will be like usual and the pain will dissipate by later on that day. I dislike turning to pain killers but will do so if it gets too much. Update on February 21, 2009: I noticed my front uppers are flared out again =(. I’m eating almost like normal except my bite feels a little off. This is probably from my teeth shifting. This is the second time I’ve felt like this since I had the braces placed. I imagine that everyone goes through this and like the previous time, the teeth will find their comfort zone again.